It's been pretty quiet in the writing world lately. I'm polishing, polishing, polishing the "untitled space station novel." I've also been working very hard on a new project called The Exclusive. The genre--paranormal suspense--isn't exactly in my comfort zone, but it also deals with a paranormal event and the TV news business, so I can definitely handle the finer points of the latter. I got a little messy with defining my pseudo-religious "magic" system, so I certainly have some work to do when I hit revisions. I'm about 73,000 words into it, which means I'm rounding third and heading for home on this novel. I'm fully aware that the book is a bit of a narrative mess at the moment. When I finish the first draft, I'll leave it alone for about a month, make some revisions to tie everything together, and send it off to Beta Reader Supreme. A brutal Indiana winter meant a lot of writing time but little time to get out among the people. Thankfully, I was able to make it to a couple events recently. That Book Place in Madison, Ind., holds its annual Authors Fair in March. 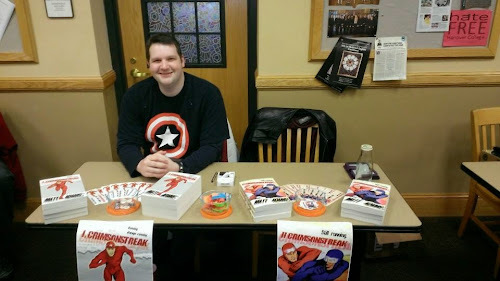 I attended the event as an author for the first time. The place is usually jam-packed during this event, but the Milton-Madison Bridge linking Indiana to Kentucky was closed this year and you could definitely tell. It's still nice to meet a few people and mingle with other authors. I went to Hanover College this weekend for the school's annual Geek-a-Thon. 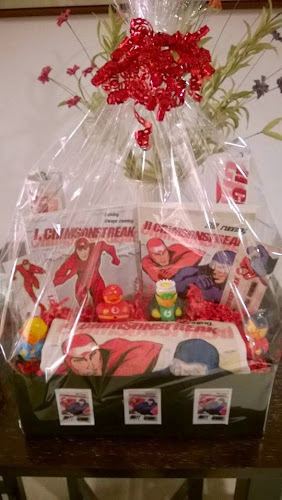 It's basically a small comic-con, and this year's theme was the very Crimsonstreak-friendly "DC vs. Marvel." 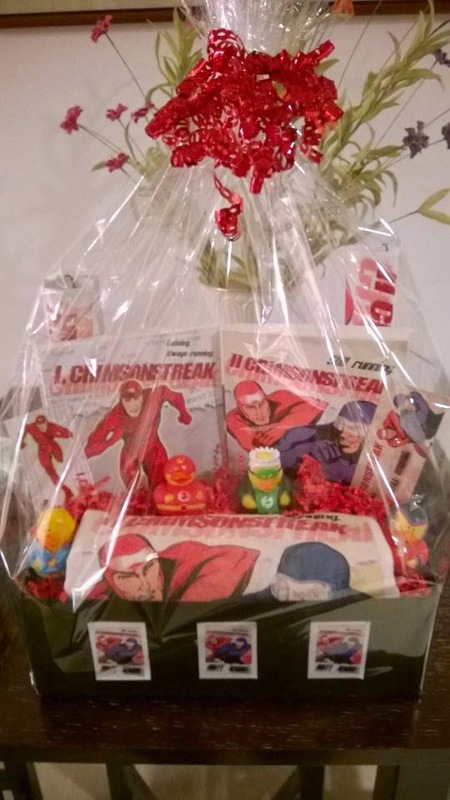 My wife made this lovely gift basket, which was available in a silent auction for charity. We met several students and had a nice time hanging out with some of the other guests. Attendance was generally light, but I think it was worth the trip down there. Between the two events, I made a few sales, met a lot of great people, and mingled with some author friends I haven't seen in a while. All worth it, in my book.